And former Panel Patterer Emilia Packard has a piece up at No Flying No Tights on Peter Dunlop Shohl's MY DEGENERATION: A JOURNEY THROUGH PARKINSON’S. 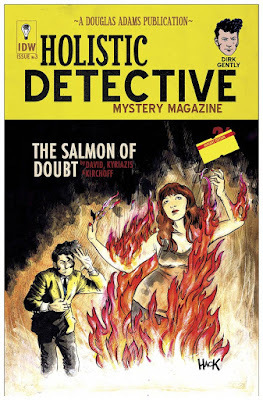 Like his artwork on Sabrina, Robert Hack's variant cover for Dirk Gently's Holistic Detective Agency: Salmon of Doubt #3 is a true joy in the way that he captures a timeless quality in his images. With the old paperback design of this cover, this book looks like a lot of fun. And it actually looks a bit like a Matt Kindt cover as well. Kindt and Hack have a similar approach to their images. Hack's cover here is fairly simple but the simpleness is deceptive because the strength of his drawings is more in the complete image than in any single element of it. ** ONWARD AND UPWARD WITH ALEJANDRO JODOROWSKY (Fandor)-- I live by a simple rule: always link to interviews with Jodorowsky. It doesn't even really need to be about his comic work. 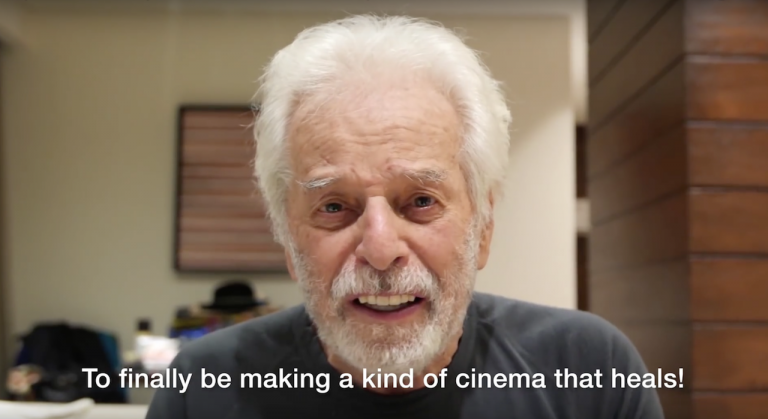 Jodorowsky: Everybody knows the system we live in is bad. No one is happy. We know that politics is rotten, and that religion is a business. Everybody knows economics has no justice. There are a lot of people who don’t have enough, and a lot who have too much. We know we’re destroying the Earth. Actually, we know everything are we doing wrong. And if we knew everything that will be in the future, we would change it. When I made films in the past, I could kill an animal. I believed that killing animals for art was to sacrifice them, like in religion. But I was not aware of animals suffering. Then many people came out who started to shout about why do we kill animals if they are nice and beautiful. Naturally, now we eat less meat. It is like this—step by step. In the future, the new generation will make a political revolution, because the world is no good right now. Everybody knows that war is a business. How many young people would like to go to a war and get killed today? People right now are global, they don’t want to die for their countries. Violence is now happening elsewhere, especially over access to water. *** THE BEGUILING ANNOUNCES MOVE TO COLLEGE STREET (Sequential)-- I've only been to The Beguiling once. A couple of years ago, we drove up to Toronto for a vacation and stayed in the downtown area. 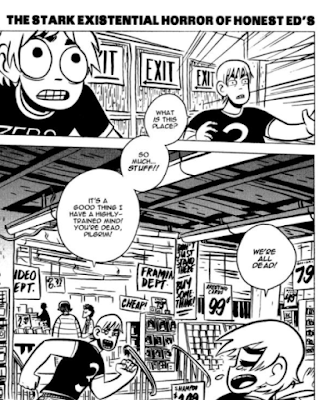 There are actually a number of really good shops in that area but the big one I really wanted to hit was The Beguiling and, since it's in Scott Pilgrim, Honest Ed's. This was probably a year or two before it was announced that Honest Ed's had sold all of the property on that block for future development. So my son (probably 8 or 9 years old at the time) and I wandered around the store for a bit. He was getting impatient and but I was in heaven up, on the second floor, somewhere around the DC Showcase bookshelf. I maybe already had one or two in my hand and was just starting to dig through their deep collection. And then it happened-- my son barfed in that corner. So there you go; that's my memory of The Beguiling. If I ever get a chance, I probably owe the staff of The Beguiling a beer because I quickly apologized, dropped the books, and ran my son out the door before he could spew any more around the store. For some weird reason, this is one of my favorite memories related to comics. (I can rank it favorite because my son was only suffering from motion sickness after paying more attention to his Gameboy as we drove around Toronto to get to the store. Howard Chaykin #1 -- At a Chicago Comicon (back when it was still great before Wizard bought it,) I was standing in line for Howard Chaykin. This was probably around 1987 or 1988. When there was only one person in front of me, I reached into my pocket and pulled something out. Somehow, Chaykin saw this and momentarily freaked out at me thinking I had pulled a live mouse out of my pocket. It was only my Gumby digital watch. I honestly don't think I stayed in line after that because it would be years before I would get a Chaykin autograph. (stay tuned for that story. Sometime in the late 1990s, my friend Ty and I drove into Chicago and hit the great Chicago Comics. As we were wandering the store, Alex Ross came in to pick up some books and he started browsing around the store, just like we were. (Remember, we're in Chicago. Seeing a comic creator around here can be rare sometimes. It's not like we're NYC or Portland.) I turned to Ty and dared him to go over by Alex Ross. Really all I wanted to do was push Ty into Ross. Don't know why. We were kids then and the thought of pushing Ty into Ross greatly amused me. Howard Chaykin #2: Around 2010, Chaykin was a guest of Wizard World Chicago. Ty (there he is again) and I were back in line to get a signature. Whoever was in front of us got into a discussion with Chaykin about aging and thinning hair or losing hair. Chaykin saw me and said something like I had a great head of hair (I'll remember that moment forever) but I'll lose it when I turn 40. He then asked me how old I was. I was 40 years old. He shot daggers at me and I think may have cursed me in Yiddish. Long story short, I got my copy of the American Flagg! collection signed by Chaykin, probably the one and only Chaykin signature I have on any book. Let's just keep the Howard Chaykin love going with this video from the 1980s of an interview with Chaykin about tough guys.